Someone I work with had his iPad at work today and we were talking about the cover. It was soft leather cover that really seemed to protect his iPad. We spent some time talking about some of the different types of covers that are available for the iPad and then we started discussing covers for the iPhone and he mentioned a new one that is known as the Tidy Tilt. As you can see in the picture below, it is a nice looking protector that is also padded, but it offers some additional features. 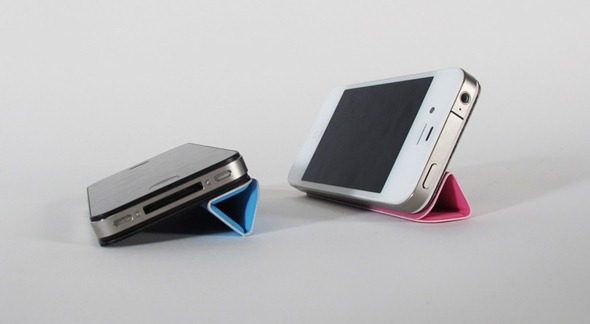 You can use it as a stand that can sit at a slight angle. You can use it to keep your earbud cords from getting all tangled and twisted up. With this protector, you can sit back and watch your favorite movies or videos and not have to hold it the whole time that you viewing them. As you can see, the Tidy Tilt holds the iPhone in a landscape position. The Tidy Tilt can be preordered in four different colors. You can preorder them in blue, green, pink or black. It will take a minimum of a month before you will receive your order and will cost you $19 if you decide that you want to order it. This is being sold through Kickstarter and has ove 1,00 supporters and has raised over $41,000 dollars. The Tidy Tilt also has magnets placed so that you can mount on any magnetic surfaces. Hang your phone on your refrigerator, on a magnetic white board or hang it on your keyholder. Created by 2 design students at the IIT Institute of Design in Chicago, they feel as if they have designed a product that will meet the needs of the users. By using Kickstarter as their funding avenue, they also believe that it will help them start their design firm as well as fund their first product. 0 Respones to "The New iPhone Cover"